Falco Motorcycle Boots announce the arrival of a new model of boots for motorcycles. Already available at Kimpex, these new urban-style boots will leave no one indifferent. 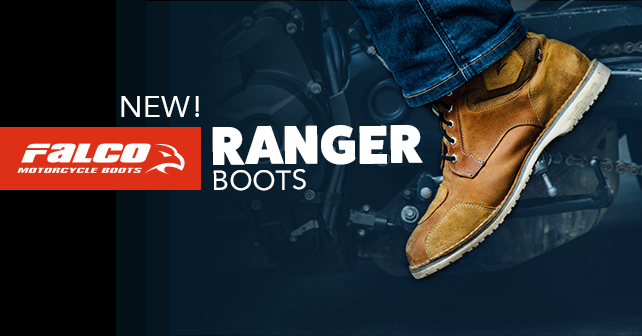 The new Falco Ranger boot combines style and safety. Just because a motorcycle boot needs to be safe, it does not mean it can’t have style. Again, Falco Motorcycle Boots demonstrate this once again. You can order your new Ranger boot in dark brown, pale brown and matt black. You can find on the Ranger boots toe and heel reinforcement and also contains the D30 technology. D30 protects you from impacts by absorbing violent shocks. The outside of the boot is made of leather in all different conditions of use, the full-grain leather upper with denim textile inserts and High-Tex inner liner membranes will support the foot maximizing water repellence and breathability. The heavy-duty classic "Goodyear" stitched Vibram® rubber soles helps to maintain optimal control on bike foot pegs. The practical double-closure system with zip and laces with hidden pocket storage and the CE certification are the additional technical details that characterize this Italian quality product. If you are looking for a boot with a vintage look on the outside and a lot of technology inside, the new Falco Ranger Motorcycle Boots. Ride safely and keep an impeccable look with the Ranger boots. Falco is recognized for making comfortable, safe, beautiful but also high-quality products and hits hard with the new Ranger model.Discover the complete collection on the Kimpex website. Discover the latest news, events and products on the Kimpex News. Browse the various sections that offer interesting content for the true enthusiasts!